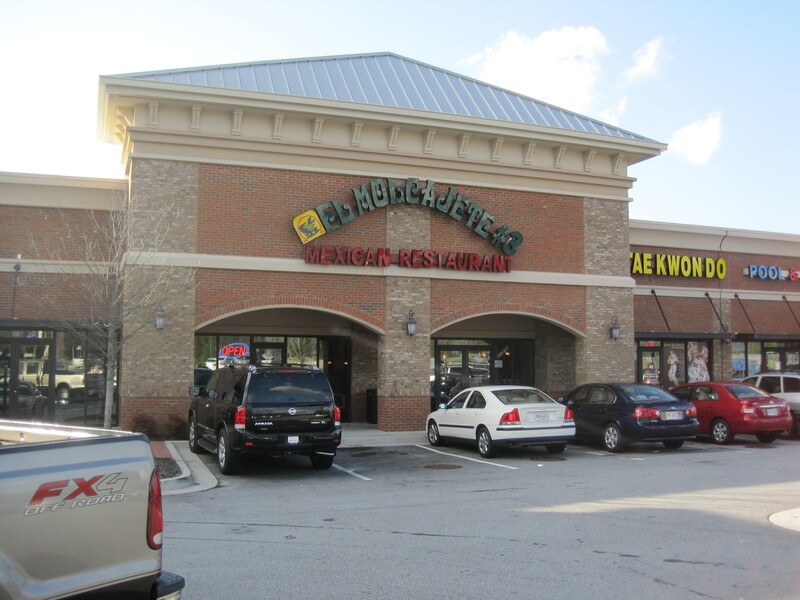 El Molcajete is a small chain, with a version out in the Hamilton Mill area, an exit or two north of the Mall of Georgia exit. Exit 85 onto Hamilton Mill, heading west, and the restaurant will be on your left. It’s in a strip mall, one that has a restaurant named ‘Oriental’ and that bright ‘Oriental’ is much easier to see than the green letters of El Molcajete. This is a restaurant with a large menu. Parts of it look like the same old Atlanta style Tex Mex. Yes, you can find a “Speedy Gonzales” here. But other parts, especially dinner entrees, are more authentic. My daughter spotted the Super Molcajete and ordered that. I saw a spicy seafood soup and ordered that. We called my wife and she wanted fajitas to go. You get free chips and salsa with your meal. Chips are crisp, dry, and good. Even the ‘to go’ chips retain that character. El Molcajete has 2 salsas. The chipotle salsa, the dark one, is rich in flavors and much better than the stock red. Super Molcajete. A dish for two. 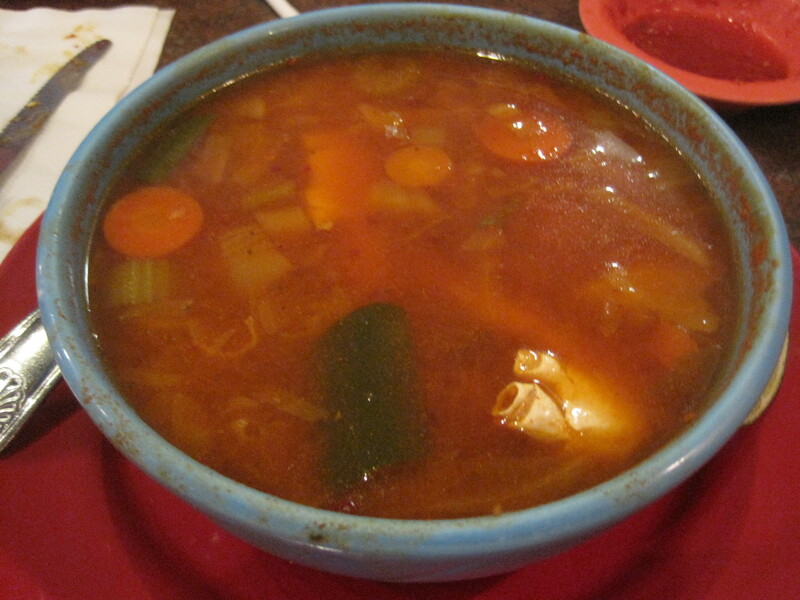 Spicy seafood soup. Plates like canned vegetable soup, but much better tasting. The servings size here is enormous. 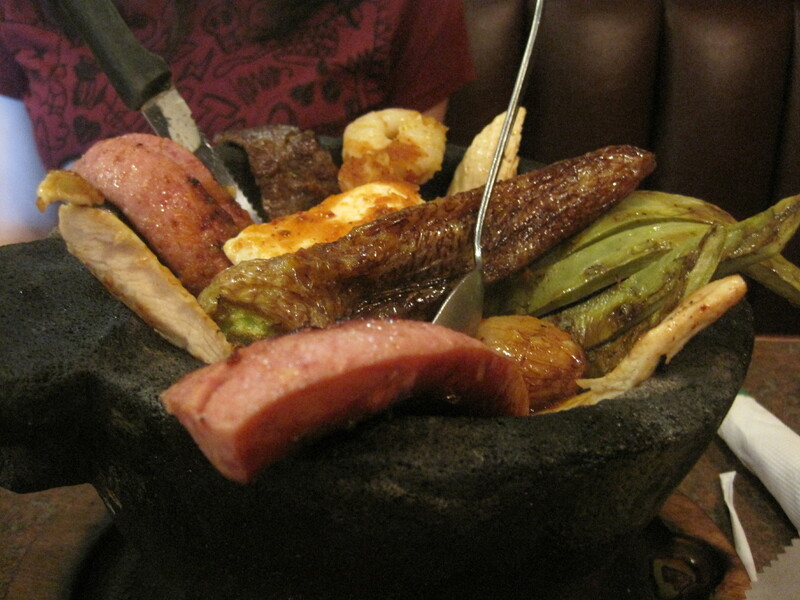 The molcajete dish (grilled meats and veggies in a stone mortar) is a meal for two. The soup was enough for one. The grilled pepper in the molcahete has some real bite, if you eat it with seeds. But it looked so enticing I asked my daughter for a bite. In terms of sheer display, the molcajete here is a disappointment compared to Zapatas. No bubbly cheese, the dish arrived barely steaming. The soup, for that matter, arrived with carrots as a significant component of the ‘eye candy’. Yes, it was nice that a half cluster of crab was visible, but plating a beautiful dish isn’t the focus at this eatery. Instead, it’s a clearly suburban joint. The “Speedy Gonzales” shows that. The decent food in enormous quantities shows that. My soup had a partial crab cluster, plenty of fish, some shrimp, a good broth that got better as the meal went on. My daughter’s dish had things like grilled sausage, grilled chicken, a skewer of shrimp, the lovely pepper, and some grilled cactus. Both dishes were worthwhile. In summary, the originality of El Molcajete makes it worth the trouble, if you’re up around Buford, to seek out. But the style of food is clearly playing to neighborhood tastes, as opposed to being a routine destination for ITPers.